Michael Scharf is Interim Dean of Case Western Reserve University School of Law. 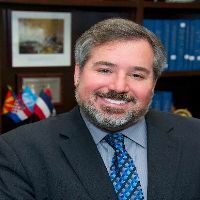 Before becoming a law professor, Scharf served as Attorney-Adviser for United Nations Affairs at the U.S. Department of State. He is the author of 17 books, three of which have won national book awards. His latest book is “Prosecuting Maritime Piracy” (Cambridge University Press, 2015). During a sabbatical in 2008, he served as Special Assistant to the International Prosecutor of the Cambodia Genocide Tribunal. In addition, he was co-founder and continues to serve as Managing Director of the Public International Law and Policy Group, a Nobel Peace Prize- nominated NGO. He is also the host of “Talking Foreign Policy,” a radio program broadcast on Cleveland’s NPR station.